I had to take my car in for a few repairs the other day. The conversation went something like this. Thanks to Mark for the link. If you can’t see the video you can watch it here. I suppose after 11 years of living in Nashville it’s about time I participated in the Country Music Marathon. No, I did not run it. But I had two rockin’ friends that DID run it and ran it in style. Congrats to Josh and Dave (first marathon props!!) for taking on the hills of Music City! And to everyone else who braved the pavement, you’re awesome. Me? I worked the water table. 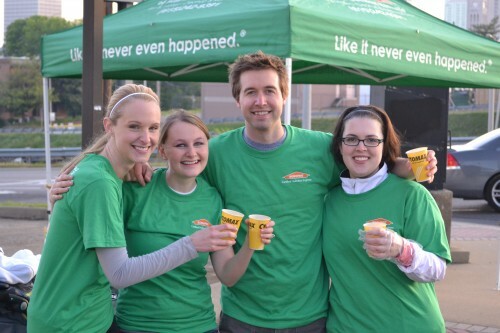 Steph, Jess, Kristen and a handful of others from Grace Community manned the Servpro Hydration Station at mile 3. Mile 3 is far enough in to a marathon where people are starting to get thirsty, but not so far in that those who ultimately don’t make it have given up yet. Plus it’s also close enough to the start line that people are still pretty well grouped together and come at you en masse – 35,000 people en masse. Basically this means in the course of a 30 minute period you witness the entire range of human emotions, from energized enthusiasm to homicidal desperation. It was our job to serve all these people – both the enthused and the desperate – water and Cytomax, a drink commonly known amongst seasoned runners as foul-tasting rip-off Gatorade. This was a difficult job. Things started off with a bang. The Kenyans blew by us, sprinting through the water station hardly batting an eye. The rest of the leaders followed closely behind, and we got into the rhythm of grabbing handfuls of Cytomax cups from our beautifully stacked hydration table. Let’s pause a moment and recognize the architectural wonder that was our hydration table. 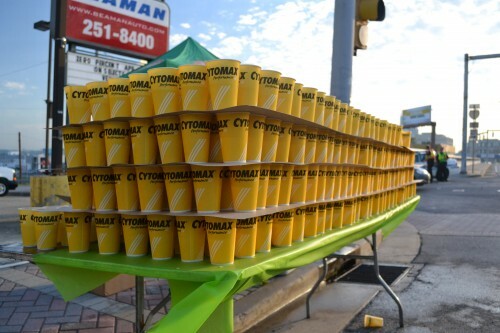 They said it couldn’t be done, but we successfully stacked tiny cups of Cytomax four levels high on a folding table, giving us about 750 pre-filled cups at the start of the race. Pretty sure everyone else topped out at three levels. Things started to get interesting about 20 minutes in when it was clear our slow pace at resupplying the table was drastically under-performing our ability to quickly give out Cytomax cups. As we cleared the last layer of pre-filled cups we decided to cut our losses and redirect energy towards re-filling. As a side note, runners of Nashville, I’m not sure if you knew this or not, but Cytomax is created by mixing measured portions of Cytomax powder in giant coolers of water. The water is sourced via garden hose from nearby fire hydrants. The resulting Cytomax solution is dumped into a 45 gallon garbage barrel lined with two heavy-duty black garbage bags and secured with a hefty portion of duct tape. I cannot comment as to whether this is a sterile process or not. At 40 minutes into the race we were at a complete loss. A long-lost lecture in macroeconomics came to mind, recalling that some professor somewhere told us that supply equals demand. Except this was false, as our supply had reached zero and demand had skyrocketed through the roof. I’m sure the professor had addressed this situation as well, but it was simply impossible to keep up. “Keep going up” is the last thing a homicidal desperate person wants to hear after they’ve run a mile uphill and can see that the incline only continues in front of them for the foreseeable future. The runners keep coming at her. “We don’t have anything! We’re completely out! Keep moving! They keep coming. At this point she tries to have a logical discussion. We call this an exercise in futility. This continued for about an hour and a half. She may have been hitting runners, I’m not sure. And they never did listen. They would grab empty cups off our table and then give us a scowling, disgusted look as they threw the cup at the curb. We had considered shouting demeaning insults at them. Things like, “Well if you had run a little faster you wouldn’t be in this predicament would you?” Or, “Maybe you should have thought about the fact you were thirsty before you took off sprinting down the street!” But let’s face it, they were the ones actually out there running the race, and that’s something in itself. At one point a wide-eyed middle-aged lady came up to us speaking in a panicked British accent, “Can you tell me where the bathrooms are?” And I think Steph responded, “They’re just up the hill a little bit, about half a block more.” And she said, “I can’t wait that long.” And Steph said, “You’re almost there – it’s literally just a few feet more.” And she said, “I can’t do it. I have already got the poop in my pants.” And, well, the conversation went downhill from there. What do you do with that? I’m sorry ma’am but all we’ve got here are empty cups and a fire hydrant. We can hose you down if you want. Thankfully, the crazed and peculiar encounters were the minority. We had a blast, and all in all successfully served at least 80 gallons of Cytomax and water to runners on Saturday. And most everyone was very grateful for the volunteers and it was a lot of fun cheering everyone along. So, with the exception of the few of you that scowled and threw empty cups in our faces, congrats to everyone who ran the race!